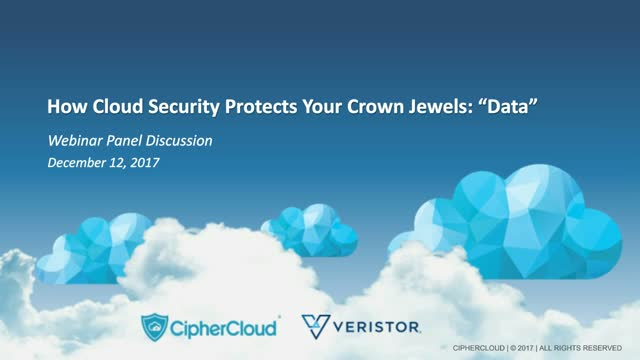 How to protect your sensitive data across multiple clouds from internal and external threats, while complying with industry regulations? See why protecting your entire cloud data lifecycle requires covering data-at-rest, in-transit, and in-use. Watch now. BRYAN COPELAND, Security Market Specialist @ Veristor. SUNDARAM LAKSHMANAN, CTO @ CipherCloud. In the aftermath of the Equifax data breach, both consumers and enterprises are scrambling for ways to minimize the impact. Since highly personal information was exposed (social security numbers, addresses, birthdays), the implications of this breach could haunt us in the long-term future. What are the lessons of this breach to individuals, as well as organizations? We all use cloud applications and are adjusting to having sensitive business data outside of our direct visibility and control. But cloud providers are not immune to security issues, and having to trust outsiders with sensitive data often conflicts with legal compliance mandates. Join security and enterprise integration experts from Accenture and CipherCloud for an interactive discussion of how businesses are balancing cloud adoption with security and regulatory compliance. CipherCloud, named as SC Magazine’s Best Product of the Year, technology is FIPS 140-2 validated and has received investments from premier venture capital firms Andreessen Horowitz, Transamerica Ventures, Delta Partners and T-Venture, the venture capital arm of Deutsche Telekom. For more information, visit www.ciphercloud.comand follow us on Twitter @ciphercloud. Presented by: BRYAN COPELAND, Security Market Specialist @ Veristor. SUNDARAM LAKSHMANAN, CTO @ CipherCloud.